On the first day of the Feast of Unleavened Bread, the disciples asked Jesus, "Where would you like us to plan for you to eat the Passover feast?" Jesus replied to them, "Go into the city and you will find a man. Tell him that we would like to come to his house for Passover." First of all, what is the Feast of Unleavened Bread? What is the Passover? These are actually the same things. The Jews celebrated the Passover ever since the time of Moses, when the Lord saved all the Israelite babies. This was when the Lord 'passed over' their houses, and they were kept safe. This is another big story your teacher will have to tell you another time. During the time of the Passover celebrations, the people didn't eat or have any bread in their homes with yeast in it. Yeast is what makes the bread all big and puffy. Without yeast, the bread is flat and that is called unleavened bread. Now back to the story. The disciples did just as Jesus asked, and they found a place and got ready for the Passover. The evening came, and Jesus and the twelve disciples sat to eat the meal. The disciples were eating quietly because they had a lot on their minds. They were worried. Some people wanted to kill Jesus since he was getting so popular. Jesus could see the disciples were worried. He said to them quietly, "I tell you the truth, one of you here will betray me." The disciples looked at each other in shock, and some of them asked Jesus, "It isn't me, is it Lord?" Jesus replied, "The one who dips his bread into the bowl with me will betray me. I will die, just as it is written, but the man who betrays me will feel sorry forever. Then Judas, with his head down spoke quietly to Jesus, "It isn't me, is it?" Jesus answered, "Yes, you are the one." Judas' head went down even lower; he had hoped that the other disciples had not heard what Jesus said. Luckily, they were paying more attention to Jesus breaking apart some bread. 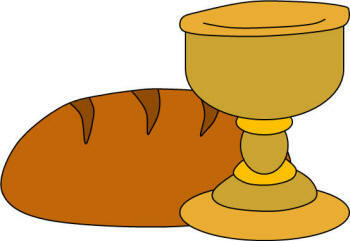 He thanked God for the bread and shared it with the disciples and said, "Take this and eat it. This is my body which is given for you". Then He took a full cup, thanked God for it and said, "This is my blood, which will be poured out for many people so their sins may be forgiven." They all took a sip from the cup. The meal continued after this; it was a long celebration. The disciples took their time because they enjoyed talking with Jesus and asking Him questions. (Just like when you go out to eat with your parents and their friends, sometimes they seem to talk forever, and you just want to go home...). After some time, Jesus got up from the table and went to a different part of the room. He took off his everyday clothes and put a large towel around himself to look like a servant. After that, he poured water into a large bowl and began to wash the disciples' feet. Then dried them with the towel that was wrapped around Him. First of all, Jesus is like a King - but even greater than a king: He's the King of Kings! By washing the disciples feet, He was doing something that only a servant would do. This would be like if someone famous came to your house and started to clean your room -- even getting down on their hands and knees to clean under your bed! It probably would never happen. When it was Peter's turn to get his feet cleaned he said to Jesus, "Lord, are you going to wash my feet?" Jesus replied, "You don't understand what I am doing, but you will later." "No," said Peter, "you will never wash my feet." He said this because he didn't feel right having Jesus wash his feet. He knew Jesus was very special. Jesus replied back to him, "If I don't wash your feet, you cannot be with me." "Then, Lord," Peter replied, "don't just wash my feet but my hands and head too." Jesus then explained that He only needed to wash his feet; and that, this would make his whole body clean. When Jesus had finished washing all of the disciples' feet, he put his everyday clothes back on and returned to the table. "Do you understand what I have done for you?" Jesus asked them. "You call me 'Teacher' and 'Lord,' and that is who I am. And now that I have washed your feet, you can also wash one another's feet." This is an example of how you should treat others. You don't have to actually wash other people's feet, but doing nice things for others and acting like a servant for Jesus, that is what He wants you to do. If you do these things, Jesus will bless you.